State and Metro Forecasts: Includes starts forecast, Excel tables of total, single-family, and multifamily housing starts by regions, states and the top 100 metropolitan areas. Learn more. Executive-Level Forecast: A monthly forecast of economic activity, inflation, interest rates and housing activity. This forecast also contain an executive summary, in-depth detail and historical data with annual and quarterly forecasts for all indicators. Download a sample. Whether you advise, consult or work specifically on improving your own company’s profitability, you can rely on the premier data source for the U.S. housing industry: HousingEconomics.com. The NAHB Economics Group has provided research and analytical solutions to member companies and professional economists since 1970. This kind of editorial excellence and in-depth analysis can only be found at www.housingeconomics.com. 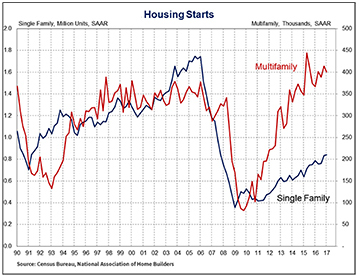 • What are Housing Starts? Housing Statistics over 30 different sets of data, downloadable either as Excel or PDF files (updated weekly).